With the drought easing in some parts of Australia, along with an increased take-up of GPS and auto steer functions, self-propelled sprayers have become more popular according to Case IH Brand Manager, Patriot Sprayer, Ross Johansson, and with good reason. 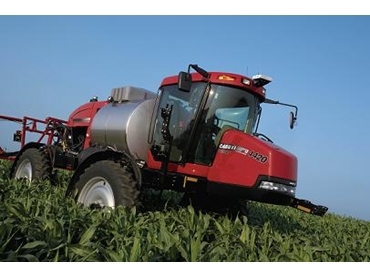 “Self-propelled equipment like Case IH’s Patriot agricultural sprayers provide significant productivity advantages over conventional tow-behind sprayers,” explained Ross. “The most obvious of these advantages is the Patriot self-propelled sprayer’s fully automated steering, which provides the ultimate in accuracy and ground speeds of up to 35 kph. This reduces overlap, which can dramatically lower a farmer’s input costs, particularly over a large area. “In 2010 Patriot models, boom functions and product application will now be controlled by the Case IH AFS Pro 600 monitor, streamlining cab controls, with one controller for both product application and boom functions as well as for the AccuGuide auto steer and mapping functions,” he said. The new AutoBoom automatic boom height control function of self-propelled sprayers reduces the potential for spray drift by continually monitoring boom height and automatically adjusting the boom back to the programmed position. The ultrasonic sensor works in addition to up to four other sensors mounted on the boom to measure and adjust the boom height relative to the ground. This maintains spray pattern and droplet size as well as avoiding costly damage to booms from hitting the ground. “By simplifying the operation of the machine and its functions, we can allow the operator to concentrate on the spraying job rather than steering. It also minimises the risk of operator error and wastage of inputs due to factors like spray drift. Because the system allows operators to store information for later benchmarking and analysis, it also helps maximise the return on investment,” said Ross.